Travel is one of the greatest gifts we can give ourselves. There is so much to discover beyond our front door, and visiting new places and experiencing different cultures is a true privilege. I actually lived abroad in Europe for about 6 months when I was in University, and over the years have visited many other regions including Southeast Asia, the Middle East, and the Caribbean. These trips gave me lifelong memories, exposed me to different cultures and traditions, and opened my eyes to the richness around us. The tricky thing around travel, though, is that it’s often costly. 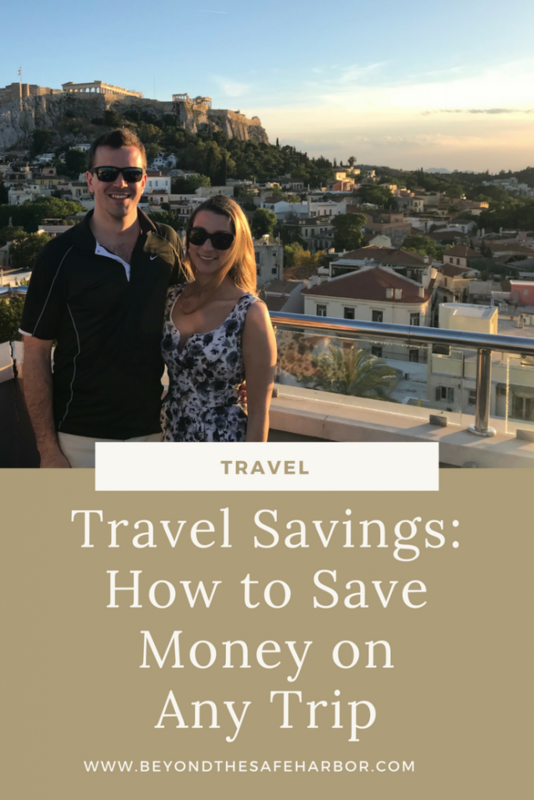 In today’s post, I’ll share some of my best tips to score travel savings, no matter the trip. #1. Travel during the off-season. If you can, travel to places when touristry is lower. You’ll likely save money on hotels, transportation, and entrance fees to certain sites. And as a bonus, the cities you visit will be less busy meaning shorter lines and less craziness! Off-season doesn’t have to mean bad weather. For example, we went to Greece on our honeymoon from late May to mid June which was perfect weather but fell just before their high season. Just search for something like “[destination] off season” to get insight into the quieter times to go. #2. Consider less trendy destinations. Just like travelling in peak season comes with a premium, so do popular cities and areas. Consider travelling to a more up and coming country, mixing a less popular region into your stay, or do popular cities smarter by staying outside the core. When we booked our trip to the Greek islands, we visited Naxos and Paros, two less-touristy islands. They ended up being some of our favourite places! Our hotels were much nicer (yet cheaper than other islands! ), it was way less touristy, and we felt we got a bit more of an authentic Greek experience there. For more about honeymooning in Greece, check out my post The Best Recommendations for a Greek Islands Honeymoon. #3. Stay at AirBNBs instead of traditional hotels. Depending on where you’re staying, you can save money by staying at an AirBNB or VRBO. And in many cases, you’ll have more space and a homier set up than a traditional hotel. When my fiancé and I went to Boston last year, we stayed at a fabulous AirBNB in Back Bay. It was a beautiful condo in an incredible location, and cost considerably less than the hotels in the area. To save even more, consider staying at hostels. While the cheapest options are often multi-bunk bed rooms (that you’d have to share with strangers), there are other options too. I’ve stayed at hostels that offered a double room with two twin beds and a private bathroom. Check out Hostelworld to see what’s available. #4. Compare hotels before booking. How does comparing hotels save you money? It lets you look at multiple factors like hotel location, whether things like breakfast and wifi are included, and more. That way, you have all the facts in making a decision and can compare apples to apples. Booking solely on price can lead you to pay more overall if, for example, your hotel is far away from key attractions causing you to spend more money on transit. My favourite site for comparing hotels is Trivago, and I used it for every single hotel we booked for our honeymoon. My post Honeymoon Hacks: How to Save Money On Your Trip shares a step-by-step guide to how I shopped on their site to find the best accommodation. Once I’ve narrowed it down to a few, I can look into those specific hotels in more detail, compare them, and decide which one to book. Trivago has already done the work to compare prices, so I’m confident that the price they show is the lowest. #5. Don’t buy every meal at a restaurant. One of the biggest travel expenses is food. Dining out for three meals a day can really add up, and it’s sometimes nice to enjoy a more simple meal anyways. Here are some workarounds. Stay at hotels that include breakfast. Many of the hotels we stayed at on our honeymoon included a buffet breakfast in the rate, which saved us money. If your hotel includes a little kitchenette, you can even cook for yourself! No appliances? Pick up some simple ingredients at the supermarket and make your own meals from that. Sandwiches are a good example. Grab convenience foods from the supermarket. Things like granola bars and to-go salads are great to have on hand and can be easily picked up at a neighbourhood grocery store. In many countries, bakeries offer delicious breakfast foods at low prices. They can also be great for snacks. #6. Take advantage of loyalty programs and gift cards. Loyalty programs can be your best friend when it comes to travel! Here are a few ways to make the most of them. Have you accumulated points with a hotel chain with properties in the cities you’re visiting? Redeem them for a free night’s stay or hotel credit. When it makes sense, book at websites or chains that have loyalty programs. Hotels.com, for example, has a loyalty program that I joined since I found myself booking most of our hotels through their site. We have almost enough for a free night which we can use on a future trip! If you’re booking any flights for your trip, see if you can fly on points! Need to stock up on travel toiletries? Redeem points from drugstore loyalty programs! A honeymoon is a great place to use any relevant gift cards. For example, if you need new sundresses for your trip, a clothing gift card you have hanging around can be put to use. #7. Save on food and drink by using the airport lounge. Until a few years ago, I had never been in an airport lounge and thought they were only for business class passengers. Then I learned that my credit card annual fee included a membership to Priority Pass and 4 lounge passes! If you’re not familiar with Priority Pass, they give you access to a network of over 1,000 airport lounges worldwide. These lounges almost always feature a food buffet, drinks, and free wifi so they’re a fantastic place to kill time before a flight. Before any trip, I look to see what lounges they work with in the airports we’re visiting, and where they’re located in the airport. Then my fiancé and I can both use the lounge at no extra cost by simply using some of our passes. This saves money on food, drink, and wifi, and also provides a more comfortable and quiet space while we wait for our flight. Check to see if your credit card includes a Priority Pass membership or something similar. If not, it may still be worth paying to use a lounge depending on the lounge fee and other options. Note that you may need to apply for your membership card with Priority Pass to use their services. While my credit card gives me the membership for free, I still needed to contact Priority Pass to claim my membership and receive the card. #8. Use bundling offers if you’re planning a lot of sightseeing. If you’re planning on visiting many museums, galleries, or attractions, consider purchasing a CityPASS. They bundle multiple tickets together for a lower price. We bought the CityPASS for Boston last year and saved a lot of money on our sightseeing. CityPASS offers discounts in 12 different cities/regions, so it’s worth looking into whether they offer a deal for your destination. #9. Map out some details in advance. While it’s important to have some degree of flexibility, a complete lack of planning can cost you. Think: overpriced tourist trap restaurants and inflated ferry prices. To map out some details ahead of time, check travel guides for recommendations. They can guide you with respect to what makes sense to book in advance versus wait. And they can also suggest restaurants and travel agencies for once you’re there. Some reliable options for travel guides are from Fodor’s, DK Eyewitness, Lonely Planet, and Frommer’s. #10. Get a travel phone plan. Avoid a surprising cell phone bill by planning in advance. Many wireless providers have travel plans where you can basically extend your plan to another country. So you’re “roaming like home” with the same amount of data and phone minutes for around $10 per day. There you have it: 10 ways to save money on any trip. Do you have any good travel savings hacks? Leave me a comment below letting me know!